(Nanowerk News) Juan Hinestroza and his students live in a cotton-soft nano world, where they create clothing that kills bacteria, conducts electricity, wards off malaria, captures harmful gas and weaves transistors into shirts and dresses. 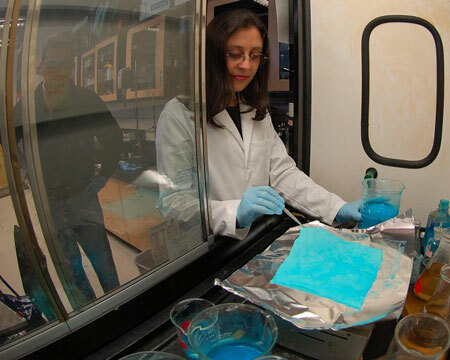 Marcia Silva da Pinto, post-doctoral researcher, works on growing metal organic frameworks onto cotton samples to create a filtration system capable of capturing toxic gas, as Juan Hinestroza looks on. “Creating transistors and other components using cotton fibers brings a new perspective to the seamless integration of electronics and textiles, enabling the creation of unique wearable electronic devices,” Hinestroza said. Abbey Liebman ’10 created a dress using conductive cotton threads capable of charging an iPhone. With ultrathin solar panels for trim and a USB charger tucked into the waist, the Southwest-inspired garment captured enough sunshine to charge cell phones and other handheld devices – allowing the wearer to stay plugged in. The technology may be embedded into shirts to measure heart rate or analyze sweat, sewn into pillows to monitor brain signals or applied to interactive textiles with heating and cooling capabilities. “Previous technologies have achieved similar functionalities, but those fibers became rigid or heavy, unlike our yarns, which are friendly to further processing, such as weaving, sewing and knitting,” Hinestroza said. Synthesizing nanoparticles and attaching them to cotton not only creates color on fiber surfaces without the use of dyes, but the new surfaces can efficiently kill 99.9 percent of bacteria, which could help in warding colds, flu and other diseases. Two of Hinestroza’s students created a hooded bodysuit embedded with insecticides – using metal organic framework molecules, or MOFs – to fend off malarial mosquitoes. Malaria kills more than 600,000 people annually in Africa. While insecticide-treated nets are common in African homes, the anti-malarial garment can be worn during the day to provide extra protection and does not dissipate like skin-based repellants.